Product prices and availability are accurate as of 2019-04-21 04:52:56 UTC and are subject to change. Any price and availability information displayed on http://www.amazon.com/ at the time of purchase will apply to the purchase of this product. 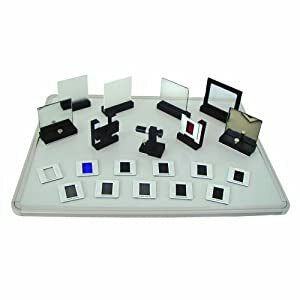 Students will take a shine to exploring fundamental phenomena in wave optics when they perform hands-on experiments with this new Laser Optics Set. Just a few of the avenues open to investigation are Refraction and interference at the surfaces of a glass block, panel with holes, square panel, grating with slits, cross grating; Michelson interferometer; Investigation of linearly polarized light; Absorption of light; Reconstruction of a hologram. A partially polarized diode laser, with adjustable mounting, provides the light source. Power is supplied from a plug-in power supply (included) or from batteries. The components are magnetic and can be placed horizontally or vertically on the included metal board, according to the set-up required for the various experiments. All components are stored in a case with shaped foam inlay. Diode laser: Maximum 1 mW, laser safety class II. Wavelength: 635 nm. Plug-in power supply: primary 100 VAC - 240 VAC. secondary 3 VDC, 300 mA. Battery holder: for 2 x 1.5 V AA batteries (batteries not included). Equipment Set Includes 1 Diode laser with adjustable mounting; 1 Plug-in power supply; 1 Battery holder (without batteries); 2 Mirrors with adjustable mounting; 1 Half-silvered mirror; 1 Screen, white; 1 Screen, frosted glass; 1 Convex lens; 1 Polarization filter; 1 Holder for lens and filter; 3 Color filters in slide frames (red, green, blue); 2 Panels with holes in slide frames; 2 Square panels in slide frames; 3 Gratings with slits in slide frames; 1 Cross grating in slide frame; 1 Glass plate in slide frame; 1 Holder for slide frames; 1 Hologram; 1 Metal board with removable strut; 4 Rubber feet for metal board; 1 Storage case; 1 Experiment guide.